Chewy Chocolate Mint Chip Cookies - Bake.Eat.Repeat. 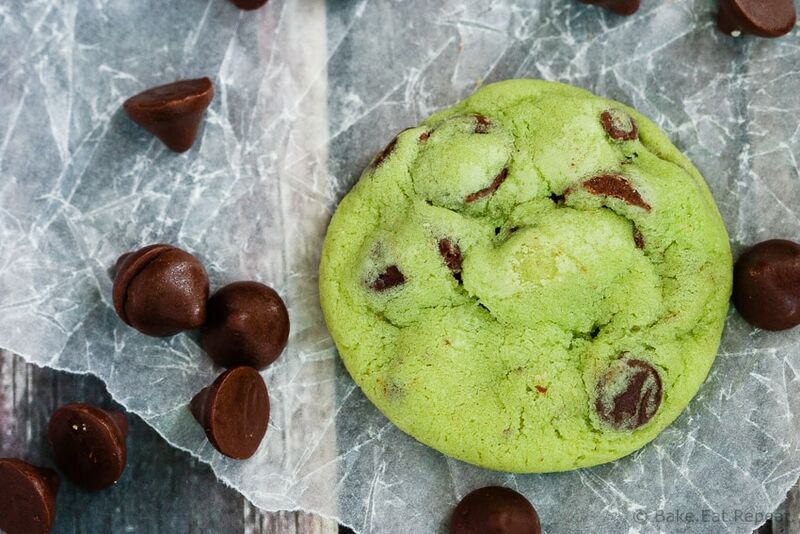 Chewy chocolate mint chip cookies that are coloured green for a perfect St. Patrick’s Day treat – or any time really! These cookies are always welcome! I finally got around to making a St. Patrick’s Day treat for you! Nothing all that exciting I’ll admit. Just chewy chocolate mint chip cookies. I just wasn’t feeling all that creative I guess. Also, I like mint chip cookies. And I had never made my kids anything green for St. Patrick’s Day. I know, what kind of mother am I, right?! So I felt the need to make myself them some minty green cookies. I also had some of those mint filled chocolate chips calling my name and begging to be used. Have you seen these things yet? I don’t think we have them in Canada yet, but I picked them up last time I was in the States. If you can get them, use them, they’re so good. I’m going to be sad when my bag is all gone! If you can’t get them, regular mint chocolate chips would work just fine. You can’t really go wrong when it comes to mint and chocolate, anyways. Right? They pretty much belong together. And these cookies are pretty amazing, and definitely will not last long around here. So you should probably go make some. Immediately. Chocolate. Mint. Chewy chocolate mint chip cookies. You know you want them. There isn’t even any chilling time with these cookies, so you could be biting into a warm, pepperminty, melty chocolate chip cookie in half an hour. You don’t even need to make them green if you don’t want to. But you know you want to. It’s fun! Go make these cookies. They’re so good. I’ll stop now. But seriously, so good, go make them. *Recipe republished and photos updated from March 4, 2015. Chewy chocolate mint chip cookies that are coloured green for a perfect St. Patrick's Day treat - or any time really! These cookies are always welcome! In a large bowl or the bowl of a stand mixer, cream the butter, sugar and brown sugar together until light and fluffy. Add the egg, peppermint extract, and food colouring (if using), and cream until smooth. In another bowl whisk together the flour, salt, baking powder and baking soda. Add this to the butter mixture and mix until well combined. Stir in the chocolate chips and mint filled chips. Form the dough into tablespoon sized balls (or use a tablespoon sized cookie scoop) and place 2 inches apart on a baking sheet. Bake for 9-10 minutes, just until the edges start to brown lightly. Do not overbake them or they will be crispy rather than chewy. They still look underbaked when you take them out but will firm up as they cool. Let them cool on the pan for about 5 minutes and them move to a wire rack to cool completely. Cookies will keep for 7 days in a sealed container at room temperature. Source: Adapted from my favourite chocolate chip cookies [my favourite chocolate chip cookies . For those looking for real recipe review: I made these last year. My co-workers ate them all up and was raving about them. They were great and actually came out as described. I used mini chocolate chips and they came out delicious. The flavor came out minty, some may want to cut the flavoring in half. I plan to make these again for this year's cookie exchange. I would like to make these for Christmas...Do you think I can freeze them? Yes, they will freeze just fine! Just freeze them in an airtight container (or ziplock bag) after they are baked and cooled and they will be fine for up to 3 months. Anything mint chocolate chip is always a good thing! I've never tried the mint filled chips, but I'm so going to keep a look out for them. These cookies look delicious! Ugh, I get totally jealous when I think of all the cool things they have in the U.S. that we don't... Lol. I need to go on a trip down there just to pick up some supplies! I love the fun green color and LOVE the mint chocolate combo! I wish I could send them right over - then I'd stop eating them! :) Thanks Kelly! Sometimes the simplest ideas are the best ones! These look absolutely perfect. Love them! These cookies look beautiful and delicious! Great combination of flavors and photos are awesome! I have a feeling these cookies would go over VERY well here with my cookie-crazy siblings! And uh, anything GREEN is totally a killer this time of year! Love these! My daughter would flip for these!! They're gorgeous! Chocolate Mint Chip Cookies are TOTALLY exciting! Chocolate and mint is one of my favorite combos! Okay, I lied, I'm actually really excited for them cause it's my favourite combo too, I just figured most wouldn't find it too exciting!! :) Thanks Ashley! These look absolute wonderful Stacy! I love the mint and chocolate combo! Perfect for St. Patty's Day! I think these are VERY exciting, Stacey! 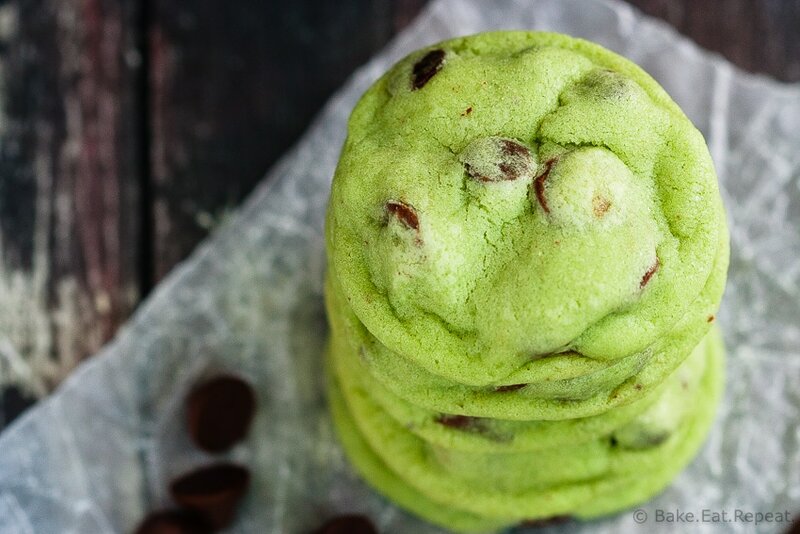 I love mint chocolate chip, and these sound delicious! Chewy cookies, always!! These look great! What a fun cookie, Stacey! Mint and chocolate pretty much makes the best combination. 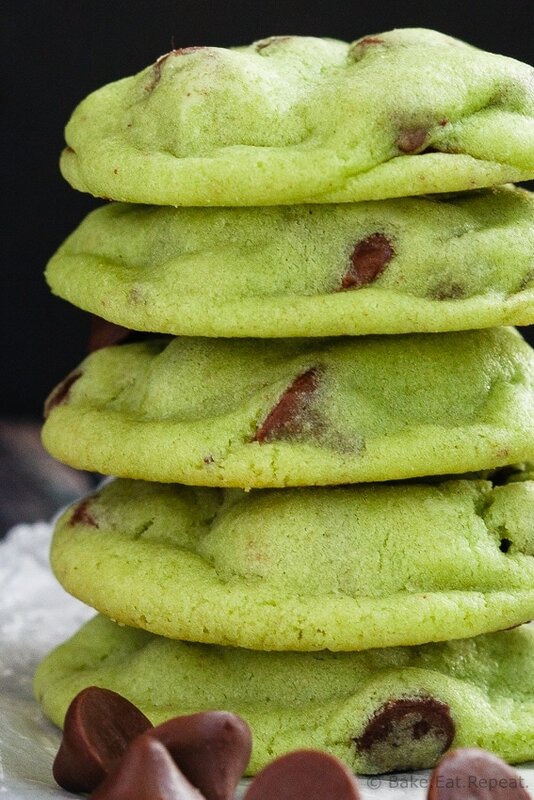 These cookies are so perfect for St. Patrick's Day!